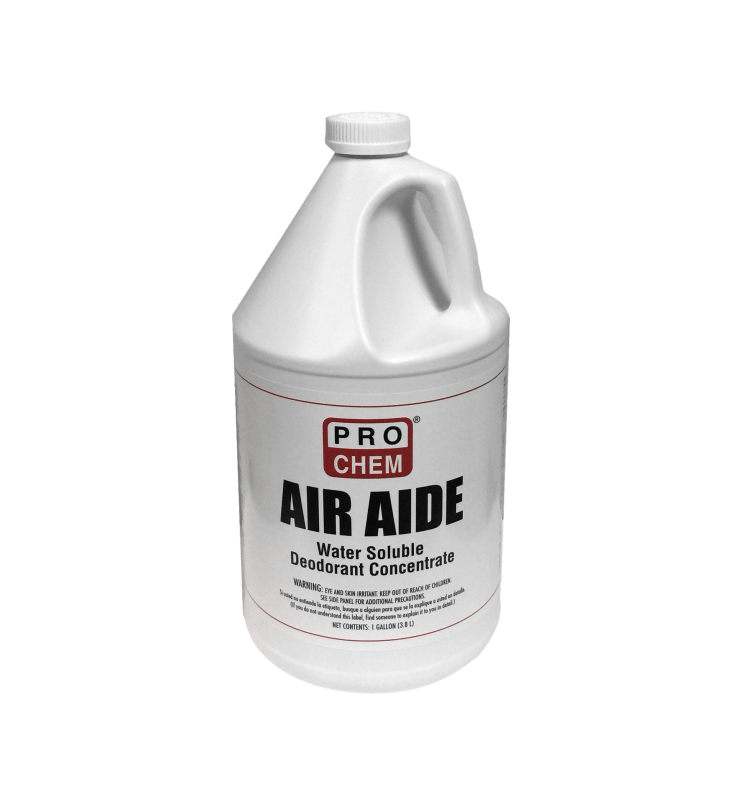 Air Aide | Pro Chem, Inc.
AIR AIDE is a super-concentrated, water-soluble deodorant. It is effective against the toughest organic odors including urine, vomit, feces and pet odors. It can also be used for general deodorizing to eliminate the smell of smoke, beer, alcohol, and cooking odors. You can also use 1 to 2 ounces in an open container of water to absorb odors. Hospitals/Nursing Homes/Veterinary Clinics/Schools/Industrial Plants: Dissolve 2 tablespoons in 1 pint of warm water. Spray on the surface or on sponge, and rinse. For floors, walls and carpets, solution may be used with soap or detergent. Gen Purpose Cleaning: Use 1-2 ounces per 3 gallons of rinse water. Use as a spray on top of full garbage cans, in wash down areas and waste receptacles. Excellent for overcoming smoke odors from fires. Air Freshening: Use 1-2 ounces in spray bottle of water. Spray room liberally. Repeat every 4 hours for effectiveness. You may also use 1-2 ounces in a vase or pan of water to absorb odors. Airplanes/Buses/Trains: 1-2 ounces in a spray bottle of water can be sprayed around galley. Spray directly on vomit and surrounding area. In lavatory, add 1 ounce to holding tank for each charge. For general cabin odor, use as a spray. Bathrooms/Lavatories: Use 2-4 ounces per gallon of wash for porcelain and tile surfaces. For spray stalls and toilets, use concentrate in drip dispensers.